go sell crazy somewhere else: THE FINISHED PRODUCT! We ran to scenic Waukegan today, that's where our boat is in dry dock. 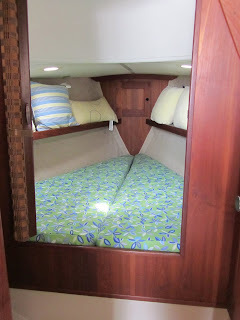 Mark had some things to do, to begin readying it for the big sail to Chicago later in the week. In addition to all the stuff we took off it last fall, we also took the finished reupholstered cushions. They look pretty good, even if I do say so myself. Speaking of should be's, I should have been in Florida this weekend... somehow THAT didn't work out. I could use a beach vacation, and NOT in Waukegan.